Once upon a time, Philadelphia was planning on building a loop line around Center City. The Broad-Ridge Spur was built off of the Broad Street Line to the busy department stores at 8th and Market, then onwards to 16th and Locust. 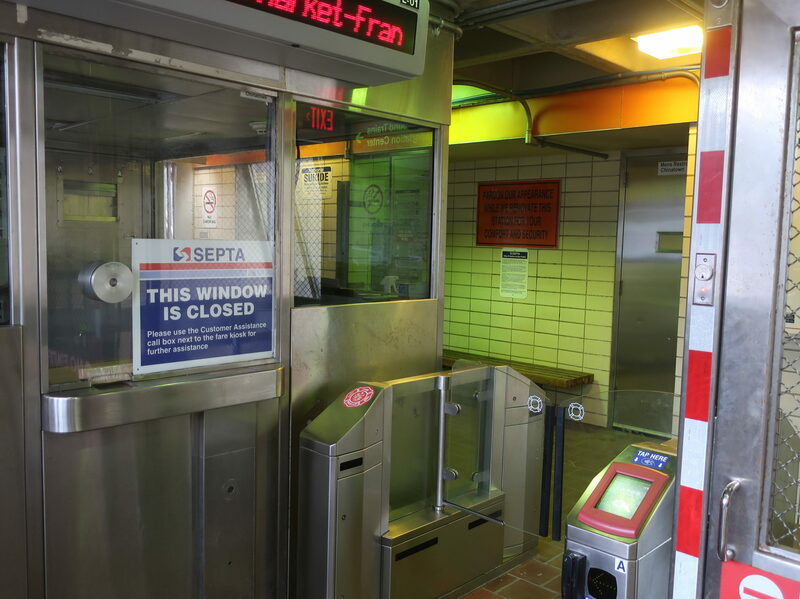 Now, there’s no money to complete the loop, 8th and Market is a less busy destination, and the route to 16th and Locust is now operated by PATCO. We’re thus left with this weird little stub of a line, and here is its one independent station: Chinatown. I don’t think you’re allowed to park th…oh, never mind. For a station called “Chinatown”, you’re not really expecting the entrance to be in a post-apocalyptic hexagonal plaza surrounded by brutalist office buildings. Well…that’s where it is. There is a nice bus shelter on 8th Street that serves the southbound routes 47 and 61, though. Also, Google Maps Street View would lead me to believe that “Chinatown buses” to New York leave from the intersection of Race and 8th, but I’ve looked at all the companies on GoToBus, and none of them seem to leave from here. And thus you see the gaping flaw of Chinatown: the platform is built for trains much longer than the ones the line actually uses. I get that this line was meant to be way more important than it is, but this is still a little problematic! The platform itself is fine, with a few benches and wastebaskets where the trains board and not much else. Oof, that’s not a great look. 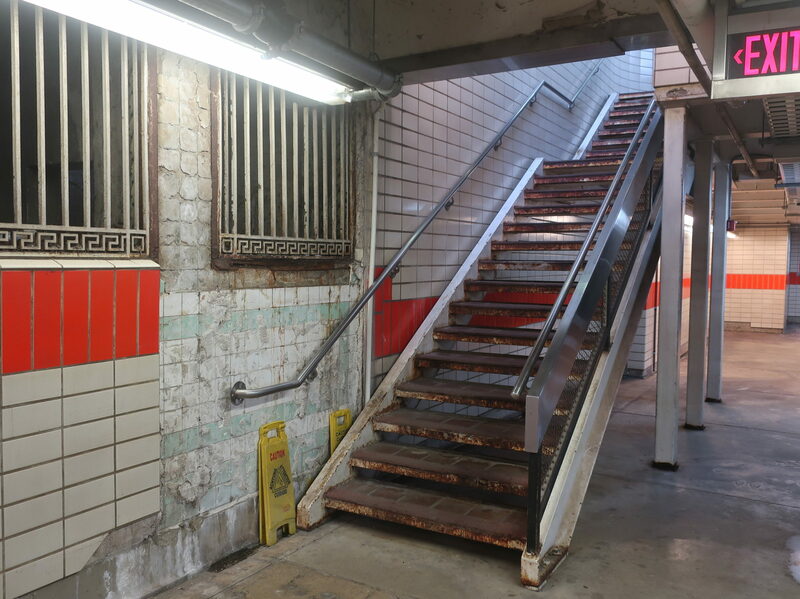 Most of the platform seems to have been renovated at some point, but the original wall shows through at the main exit stairs for each platform. At least those are the only times we have to see it. 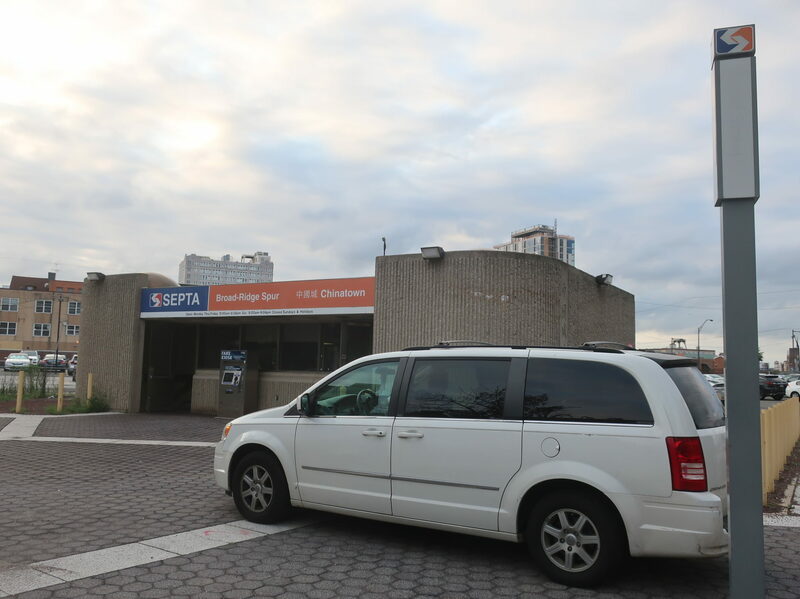 Finally, this wouldn’t be a SEPTA station without exit-only stairs; in this case, they lead to…the middle of a city parking lot. Quick, if we can get to our car before 10 AM, we get the Early Bird Special! A classic two-car train in the station. 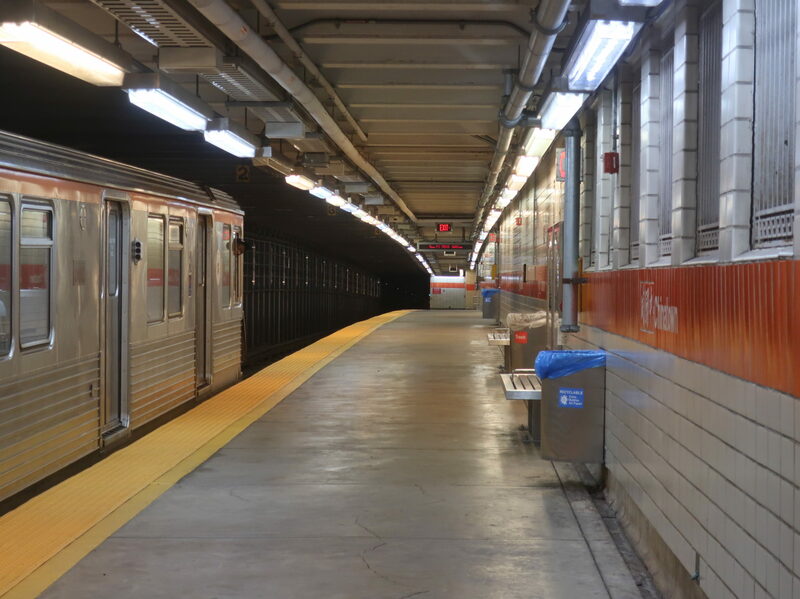 Ridership: It’s the least-used station on SEPTA rapid transit. Only 240 people per weekday use Chinatown, or about 1.5 riders per train. Pros: The aesthetics of the platform aren’t terrible, actually. It’s a pretty clean station, too, probably because so few people use it. Cons: Oh, this is just an awfully designed station. The fare line is strange, the platform is far longer than it has to be, and the exit-only stairs lead you into a parking lot surrounded by a chain link fence (yes, they’re useful for getting to some destinations, including a New Jersey Transit stop, but you still get let out in the middle of a parking lot). Because this is a Spur station, it has no night or Sunday service, which certainly doesn’t help its ridership. Also, I’ve been getting spotty cell service on the Broad Street Line in general recently, but it seems to be particularly bad at Chinatown. Anyone else noticed this? Nearby and Noteworthy: I mean…yeah, the Chinatown neighborhood is great…but also, just take the El to 11th and walk two blocks. Bam, you’re in Chinatown! One thing this station does have all to itself, though, is Franklin Square, otherwise known as the worst of the squares. You know it’s true. Even if this station wasn’t terrible in every way from a functional standpoint, it’s just really useless! 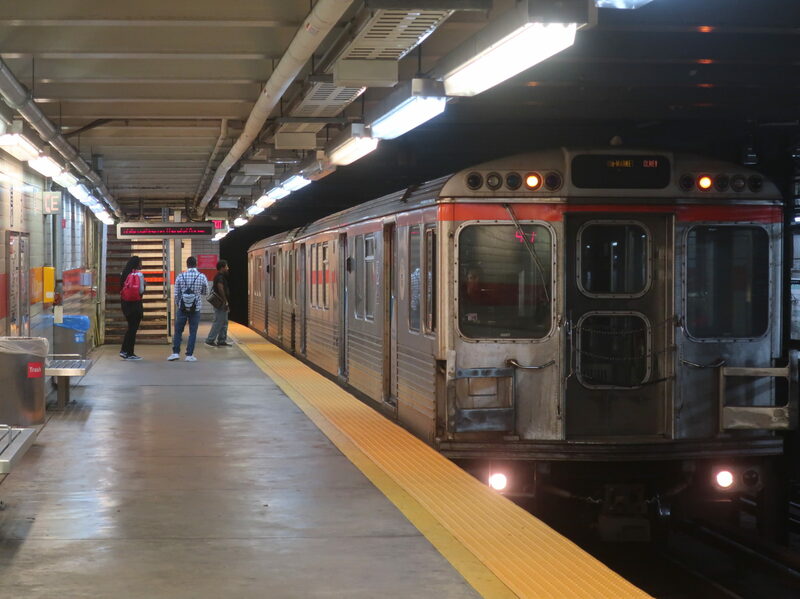 I mean, that’s partly because the Spur is useless, but the only reason to use this station over 13th is if you’re coming from North Philadelphia or from PATCO. And you don’t even have that option nights and Sundays! I’ll stick with the El, thanks. Ok, now why is the URL literally “trashed”? You know, that’s a good question. WordPress just kinda made that the URL…it is fitting, though. I wish I could be a better authority on this than I am. The only place I’ve eaten there was at Ken’s Seafood Restaurant for a band karaoke party – it was pretty good. Honestly, based on what I’ve seen walking through, so many of the restaurants look really authentic and good! I don’t know if you’re still keeping up that glossary, but you might want to add “Chinatown bus.” I had to go look that up. Happy Holidays! That’s the official name of the line. It’s just a branch.